On this day in 1948 Whittaker Chambers, an editor at Time magazine, accused Alger Hiss, a former government official and then president of the Carnegie Endowment for International Peace, of having been a Communist; later Chambers added that both he and Hiss had been involved in a Soviet spy ring in the 1930s. The case exploded into the first major national debate of what would come to be known, euphemistically and quite inaccurately, as the era of McCarthyism. In a piece about the case from early September, Thomas Sancton, a novelist and Washington editor of The Nation, focused on that precise significance. His piece makes for an eerie read today, as it is grimly apparent how much sorrow, hardship and terror could perhaps have been avoided if Sancton’s early warnings had been taken to heart. 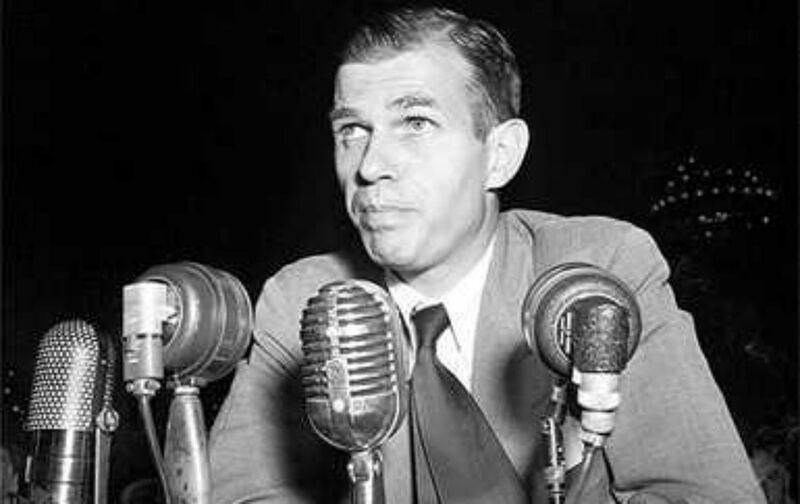 The long-awaited “confrontation” scene before the House Un-American Actitivites Committee, starring Alger Hiss and Whittaker Chambers, proved one of the most dramatic and at the same time one of the most disheartening sideshows in recent Washington history…But, spectacle though it was, the familiar naive “ballyhoo” of past Congressional investigations—as when the midget sat on J.P. Morgan’s lap—was lacking. There was something ugly in its place. The old carnival spirit had given way to an atmosphere that seemed somehow European, reminiscent of newsreels of people’s courts and party congresses. Nor were the charges the old familiar accusations of stock-market manipulation and fraudulent government contracts. Instead, the air was heavy with the ominous and ultimate charges of modern history: treason, espionage, and insanity…. The impact of the hearings as a whole is not symbolic so much as symptomatic—symptomatic of the onrushing tendency of Congressional agencies to deal in scapegoat-hunting and exposés on sensational but essentially inconsequential levels. Meanwhile, the whole vast machinery of the national economy grinds up the remaining purchasing power and rolls toward the smash-up that anybody with even a grade-school knowledge of arithmetic can see before us…. All the accusations and instances of communism in government that the committee is now investigating stem not so much from such sources as Whittaker Chambers’s present concept of primordial evil as from that other phase of his explanation which spoke of the sense of guilt and anguish that intelligent men in large numbers felt in the desolate psychological atmosphere of the Depression. If those times come again, the committee is going to have a real job on its hands.